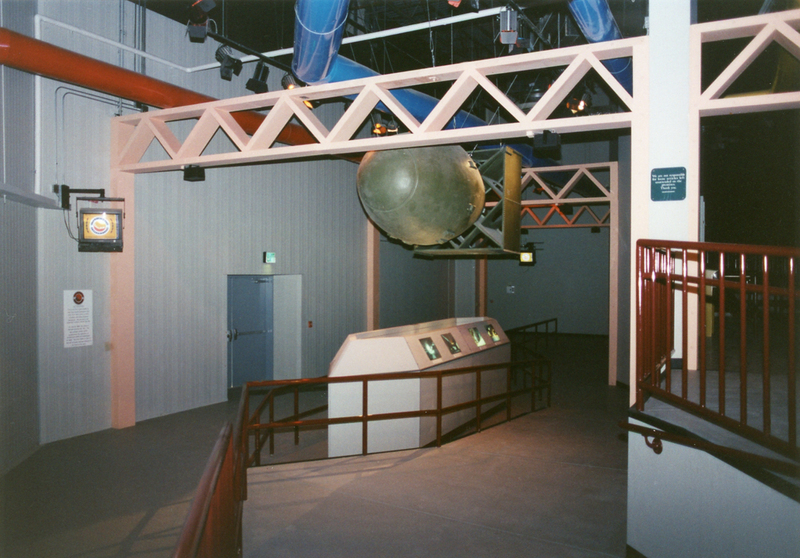 Years before The Amazing Adventures of Spiderman debuted at Islands of Adventure in Orlando, the MGM Grand Adventures Theme Park in Las Vegas opened an attraction that also utilized a simulator base that moved on a track. 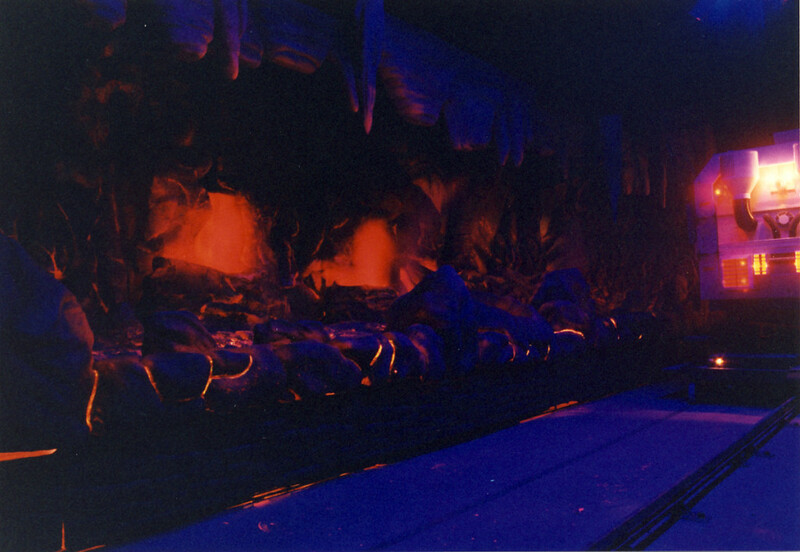 Deep Earth Exploration used a similar theme from Journey to the Center of the Earth, which opened with Tokyo Disney Sea in 2001. Today we take a look at this ground breaking attraction that was years before it’s time with some never-before-seen photos. In our last article, we discussed why the MGM Grand Adventures Park in Las Vegas got lost in the shuffle. During Sin City’s attempt to become more family friendly in the 90’s, many casinos opened attractions like Luxor’s simulator ride: Search For The Obelisk. The MGM Grand Hotel and Casino opened an entire 33 acre park with unique attractions and shows, most were custom built for this small piece of Las Vegas history. 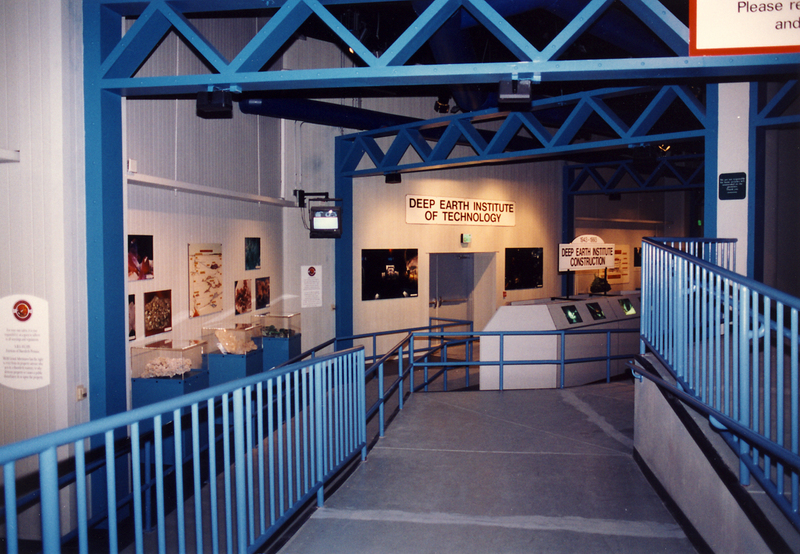 Deep Earth Exploration opened about four months after the rest of the park in 1994. A common misconception as to why the attraction was delayed is because the ride system was too sophisticated and wasn’t operating properly. While Intamin’s ride vehicles were extremely advanced, they were running along the track just fine. Aesthetically speaking, however, the ride needed some work. R&R Creative was brought in to plus the original version of the attraction because the queue, scenery and lighting just weren’t working. R&R changed the very industrial looking queue and loading area with an atom bomb hanging from the ceiling and gave it a new coat of paint along with some theming changes. The bomb was removed and new photographs and maps of what the Deep Earth scientists had discovered adorned the walls once the attraction finally opened to guests. The original version of the load area featured a very small hanging flat wall showcasing the layers of the earth and track lighting that was supposed to be modeled after a movie soundstage lighting grid. These ride vehicles, designed by Intamin, featured a motion simulator base on a moving ride track. The entire vehicle was enclosed like a traditional simulator and had a rear projected screen in the front of each car. As the car “tunneled” further into the ground, windows would open on either side showing guests a real three dimensional set movie being shown inside when the movie was turned off. 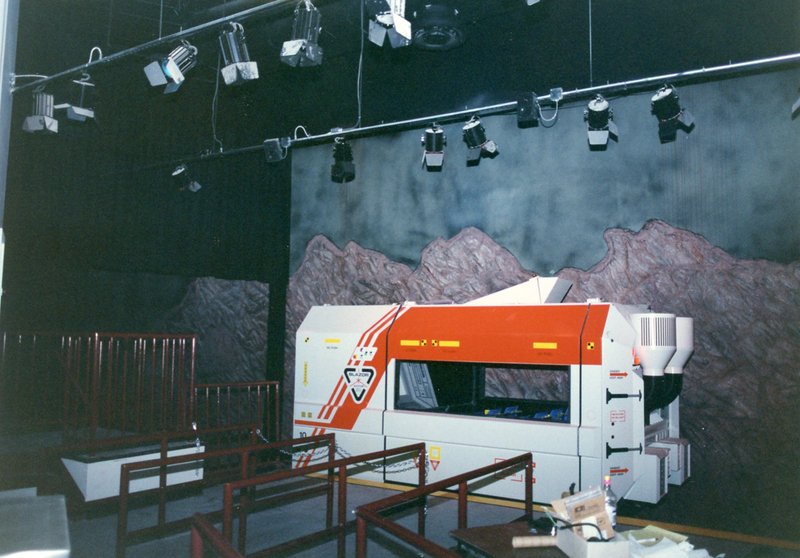 After coasting along the set, the windows would close and the simulator would come to life again utilizing the interior screen to tunnel to the next destination/show scene. 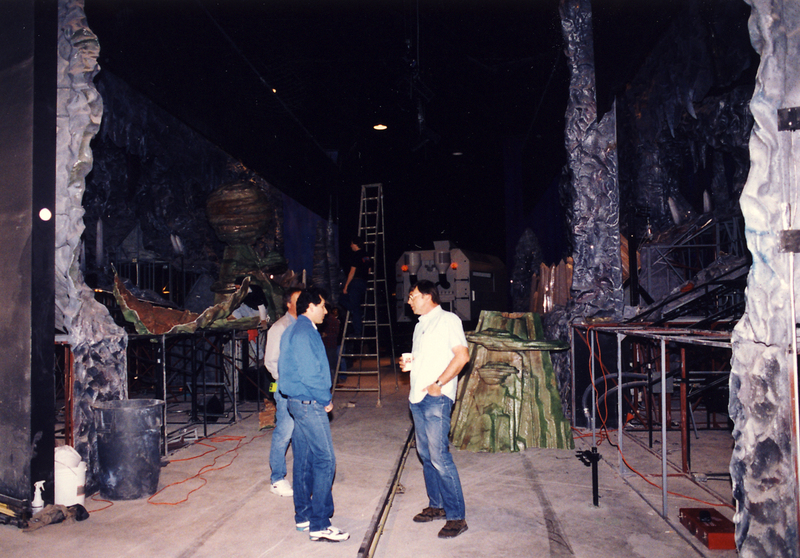 Many of the issues that R&R Creative faced when they were brought on board to make changes to the ride were obvious. The lighting in the show scenes didn’t match the lighting inside the vehicles, often blinding riders when the windows opened up. 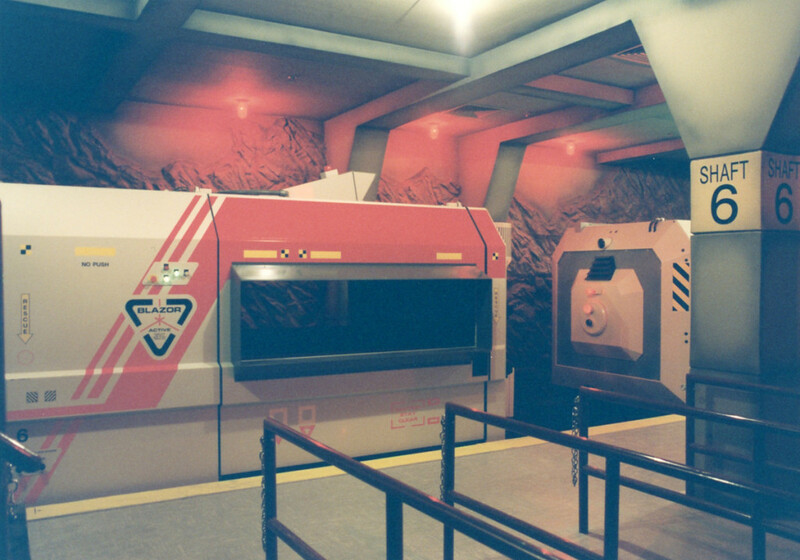 In addition, the sets were mostly painted flats and didn’t provide much more detail than the two dimension animation provided on the screen inside the vehicle. 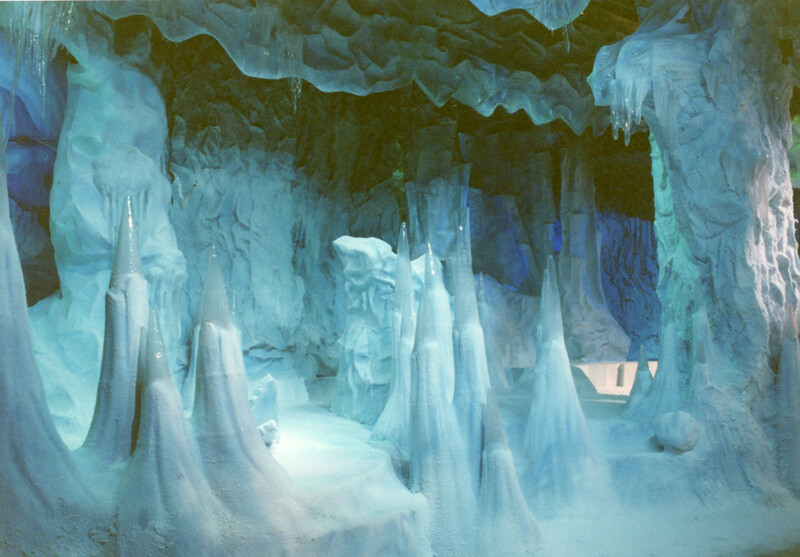 A perfect example is the earlier version of the ice cave scene, pictured above. When the windows opened up, the scene didn’t provide much depth. Notice the tentacles from above the car that attacked the vehicle as it passed through! The new and improved scene that ended up in the finished product was leaps and bounds over the original and even chilled air was added to the room for effect. As the vehicles probed deeper into the earth, they discovered a crystal cave. Lots of minerals that had yet to be discovered were found here. The finale scene took place inside an active underground volcano with flowing lava. 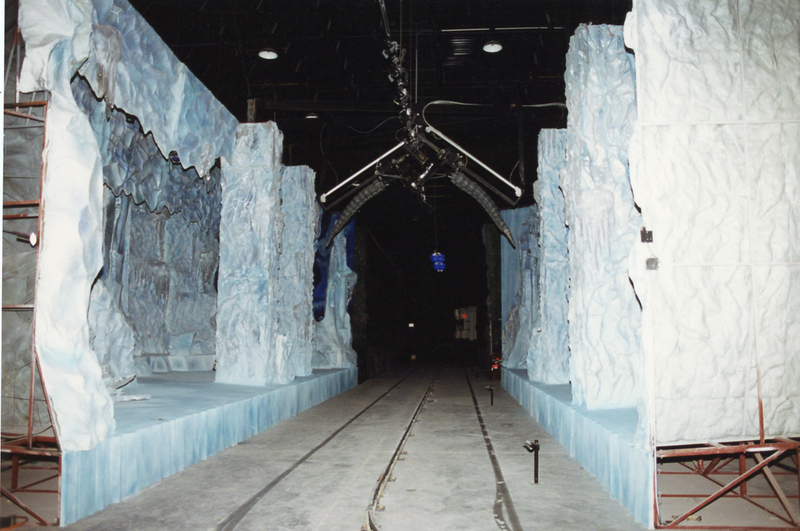 Heat was pumped into the room to make it more realistic and fire effects brought the show to life. As the vehicle entered the heart of the volcano, she started to blow, sending the vehicle back to the surface and thus, the load station. Tokyo Disney Sea’s Journey To The Center of The Earth was an opening day attraction along with the rest of the park in September of 2001. 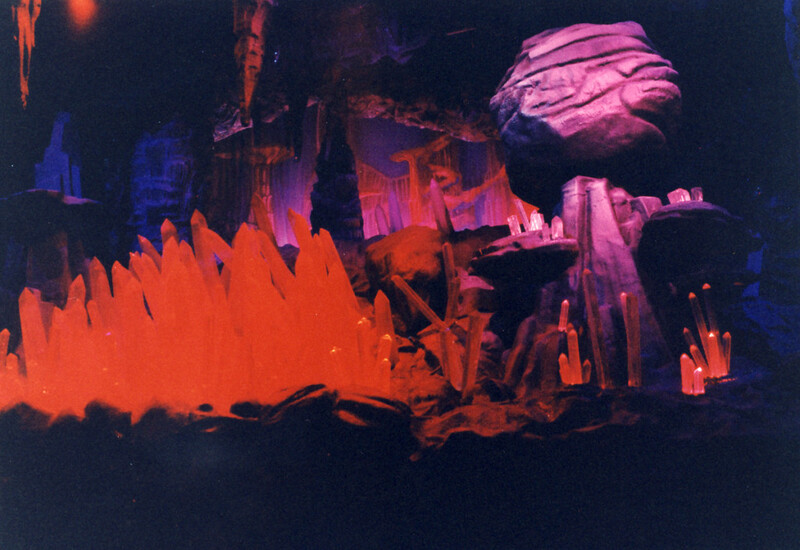 I am in no way implying that Imagineers tried to create their own version of Deep Earth Exploration, but there certainly are a decent amount of similarities. Come back next time when we explore MGM Grand Adventure’s Backlot River Tour, a water ride with an extremely familiar-looking boat that has roots tied to a famous Francis Ford Coppola film! For more stories on the world of themed entertainment, follow me on Twitter @TPUJosh by clicking here and like our Theme Park University Facebook Page by clicking here! This entry was posted in Extinct Attractions and tagged Deep Earth Exploration, Intamin Rides, Journey to the center of the earth, Las Vegas Theme Park, MGM Grand Adventures, R&R Creative, simulator dark ride, Tokyo Disney Seas. Bookmark the permalink. Trackbacks are closed, but you can post a comment. I went to this park when it was opened. I do not remember a ton about it anymore but I know we always stayed at Excailbur and would walk across the street to go. They also had different priced tickets for those riding rides and those not. Hmm I wonder if I have any pictures from there around here some where. If you do, let me know! I am compiling pictures together for future articles. I went twice to this park. Once in 1994 and again in 1998. I’m pretty sure I have video of it but nothing substantial like the interior of a dark ride or something. More like the bumper cars which were at, what I assume was, the only entrance to the park. You’d exit the hotel and be lead down a flight of stairs/ adjacent escalators to enter the park. It’s probably in the video.